Bundesliga | Six for 6,000: What does the average Bundesliga side look like? Six for 6,000: What does the average Bundesliga side look like? 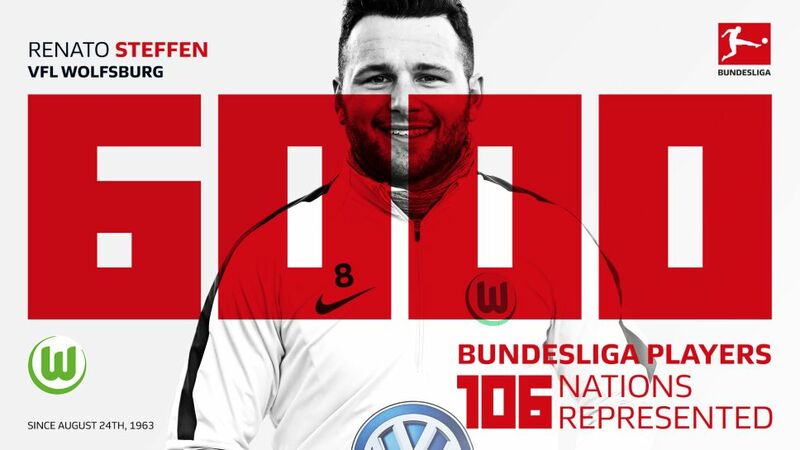 Renato Steffen made Bundesliga history by becoming the 6,000th player to appear in Germany's top flight when he made his debut for Wolfsburg against Borussia Dortmund on Matchday 18. But the story of Bundesliga newcomers goes far beyond him. bundesliga.com’s finest data scientists took a deep dive into the numbers behind the milestone to find out what an average Bundesliga team would look like. Not surprisingly, the majority of players who have made a Bundesliga appearance are German. Specifically, 3,807 of them, or 63.5 per cent of the total. Of those, 2,179 have managed to find the net, representing 62.12 per cent of all the league's goalscorers. In terms of simple footballing mathematics, this means that seven out of the 11 players in our hypothetical team would be German nationals and out of those, six would score a goal. Watch: Thomas Müller is one of the Bundesliga's biggest German stars! And what about those four spots that would go to foreign-born players? None of the other countries represented in the Bundesliga have individually contributed over 3 per cent of players to the grand total of 6,000, so one would have to take other criteria into account when choosing representatives to fill these places. If places in the team were awarded on a “first come, first serve” basis, Petar Radenokovic (1860 Munich), Willi Huberts (Eintracht Frankfurt) and Co Prins (Kaiserslautern) would have called dibs for Serbia, Austria and the Netherlands respectively on the first ever Bundesliga matchday on 24 August 1963. At the opposite end of that spectrum, taking into account the nationalities that made their first appearance most recently, we would have Armenia through Henrikh Mkhitaryan (debut on 18 August 2013 for Borussia Dortmund), Mozambique though Ronny Marcos (debut on 29 November 2014 for Hamburg) and Curacao through Charlison Benschop (debut on 15 August 2015 for Hannover). Regardless of the nationalities chosen, 20 per cent of the team, or two out of the 11 players, would have be teenagers, as 1,199 Bundesliga debutants were under the age of 20 when they made their first outing. Hamburg’s Fiete Arp, the first Bundesliga player born after the year 2000, is the latest flag-bearer of this trend. Watch: Jann-Fiete Arp's dream debut season. Although Brazil’s 147 Bundesliga players only represent 2.77 per cent of the total, they are the second-most represented nation in the league, proving that the connection between the two superpowers in world football has a rich and deep history. One of the four foreign spots in our average team would therefore necessarily have to be from the land of bossa nova, caipirinhas and Ronaldinho. There are plenty more arguments to support this claim. The first foreign player to receive the “Footballer of the Year” award in Germany was a Brazilian: Werder Bremen’s Ailton, who led the Green-Whites to a sensational Bundesliga title in the 2003/04 season. The first Latin American to become Bundesliga top scorer was Brazil’s Marcio Amoroso with Borussia Dortmund in the 2001/02 season. And that is before we even mention Giovane Elber. The mythical Bayern Munich striker won every major title on offer with the Bavarian giants, including four Bundesliga crowns, three DFB Cups (plus one with Stuttgart) and the 2000/2001 UEFA Champions League. So what of the remaining spots in our hypothetical average Bundesliga side? As goals decide games, perhaps we should focus close on the league's best marksmen. Maybe a Norwegian striker to follow in the footsteps of Jörn Andersen, who became the league’s first non-German top scorer with Eintracht Frankfurt in 1989/90. A forward from Poland would also make a fine choice. After all, Germany’s Eastern neighbour is currently the third highest-scoring nation in the league, in large part due to Robert Lewandowski and his 166 goals. Peru could also stake a legitimate claim, mainly thanks to Claudio Pizarro, the Bundesliga’s foreign record scorer with 191 goals to his name. Alternatively, we could opt for Gabon, home to Pierre-Emerick Aubameyang, who scored a hat-trick on his debut for Borussia Dortmund on 10 August 2013, the first Bundesliga appearance by a player from this African nation. Watch: Aubameyang and Lewandowski's top 10 goals. Given the current wave of American youngsters flocking to the Bundesliga, it stands to reason to wonder if a player from across the pond might make this average Bundesliga team. With 49 representatives to date, the U.S. ranks 15th among the nations with the most contributions to the Bundesliga, ahead of Serbia with 48 players, but behind Norway with 54. The first American to play in the league was Tom Dooley, who made his debut on 8 August 1986 for Homburg. Dooley was also the first American to find the net in Bundesliga history and remains the stars and stripes’ highest scorer with 20 goals, three more than Borussia Mönchengladbach’s Fabian Johnson. If Christian Pulisic and Co continue to have such an impact in the league, we would be left with no choice but to pick an American in the side. The results are in: the demographics from the sample of the Bundesliga’s first 6,000 players show that the average league squad would be composed of seven Germans, one Brazilian and three non-Germans from a variety of nations. Possibly one American. And definitely two teenagers.